Teixeira said on Tuesday that, through his communication with Pettitte, he's gotten the sense that the veteran left-hander is "leaning toward retirement." But the Yankees first baseman is holding out hope that Pettitte will return to a Yankees rotation that sorely needs him next season. "I think, like everyone else [thinks], if he's leaning one way, he's probably leaning towards retiring," Teixeira said on Tuesday at a news conference to kick off Thursday's Pinstripe Bowl game at Yankee Stadium. "I think that's what he's publicly said. It's no secret right now. That's probably where he's leaning. But in a month and a half, a lot can happen." Assuming that we're talking about good ol' SMS messages, and not photos of Andy wistfully gazing at the setting sun, there might be another angle worth acknowledging. What if this is just a case of auto-correct acting up? The tendency for that widely implemented textual heuristic software to overstep its bounds is well-documented. 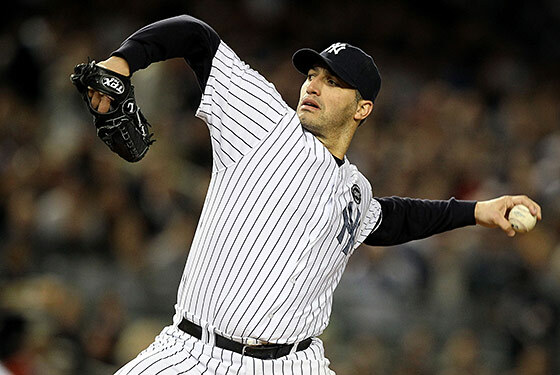 It's entirely possible that Pettitte is merely trying to convey that he's considering a "retinoscopy" or "retiling" his master bathroom, or perhaps a "reticulated python." They're supposed to make great pets, you know. With all these gadgets and their idiosyncrasies, you just can't rule out the possibility of a failure to communicate these days. Maybe we're witnessing the end of a long and storied career, or maybe the guy just wants to get himself a badass snake. The Yankees certainly hope it's the latter (provided that Andy is well-versed in snake-rearing protocol, of course).